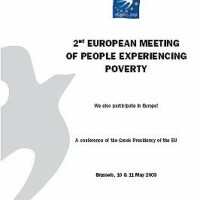 Read the full report of the second European meeting of people experiencing poverty which took place on 10th and 11th May 2003 in Brussels under the Greek Presidency. In 2002, the Belgian Government suggested a 2nd Meeting – an initiative taken up by the Greek Presidency. EAPN was asked to prepare it, but time was short to carry out proper groundwork with the delegations. The topic was “good participation practices”. The preparations and workshops produced attempts to create models for participatory processes and a demand from the delegates: people experiencing poverty want to be able to talk face-to-face with policy-makers on policies that affect them. Responding to this demand, the Greek Presidency asked the June Council for the European Meetings to become a recurrent process, like the Social Affairs Round Table.